Adults don't believe in fairy tales, do they? Well, maybe they should. Because MAGIC does exist, it's all around you. It flows through your heart, in moments when you open, invite, and allow. 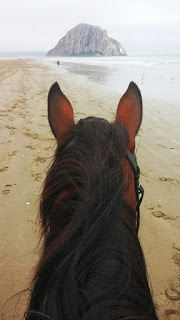 Best yet, the horses know this and will, in some least suspecting moment, transport you to all sorts of magical places. This is a story for all the Doubters. Because even I still have a Inner-Doubt Demon. And you probably do too. And what the mind wants most is PROOF. So that we can trust the messages coming from our deepest Truth. Occasionally we are gifted with Moments of Proof. This was one of those moments, gifted straight from the heart of horses. Shall it invite you to Trust Your Truth? So many magical moments occurred while I was hanging on the beach with my best friend Seren last summer. Primarily because I was without agenda. Open to be lead. Willing to feel into the spaces between the breath. This is where magic happens, when you Open, Invite, Allow. In fact, on this particular day, I had not specifically Invited. Yet my whole life that summer was one big Invitation, and so Seren swung wide the door of Opportunity and ushered me through. The open door felt like a massive wave of emotion. Sudden sobbing tears, out of nowhere, sprung from the silence of simply standing and breathing together, amidst a backdrop of beauty. Actually, I was surprised by the sudden ferocious emotion, and asked Seren, "Huh?!" "Go deeper into it, what do you feel," was her expert reply. "Grief!" Oh sobbing grief, as another layer of it washed through me from head to toe. About what? I wasn't sure. Frankly, it was a little embarrassing, as casual passerbys wanted to come say hello to the girl with a pretty horse on the beach. But I shooed them away and stuck with it, as Seren counseled, "Where do you remember feeling this before?" "Camelot!," was the first surprising answer to flow out of my awareness, as the sobs deepened. I stood still on the beach next to Seren, as she pulled closer to support me, and let the waves upon waved of grief flow through me. For what was no longer. In essence, for the beauty of an Ideal that became tarnished by human fragility before it became fully lost. And yet as the tears ebbed and my heart became still, the opening came, the knowing that here we are again, trying once more to co-create a New Earth, another opportunity to embody Love as our Deepest Truth. With that awareness, as I opened my eyes, Seren began tugging on the lead rope, leading me toward The Rock, into the flows of people on the beach. Let me be clear here. We NEVER walked in this direction. 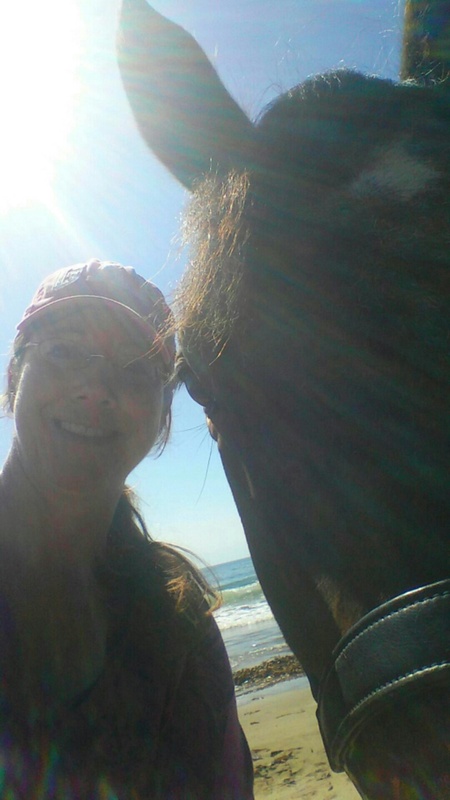 I never felt it was smart to wade into the unknown masses of people while holding a horse. So NOT even once before had we ventured in this direction. But I allowed her to lead me forward, past the Past into a New Future. Strolling together, soon, we came to a small castle made in the sand, nothing fancy, but AH-HA: A tiny Camelot in the sand!!! This was the first sand castle I had seen in my 6 weeks at the beach. I laughed out loud at the PROOF my doubting mind needed that I was experiencing grief from a distant time & place. But Seren didn't stop there, she kept pulling me in the direction of The Rock, through more & more people. I began wondering if we should continue, when the people in front of us parted to reveal: Another Castle! Seren showing me the New Camelot! I laughed even harder, and more tears, gentle this time, graced my face. I was touched by the realization that it was Pure Genius flowing through Seren that had her lead me to even more tangible PROOF. 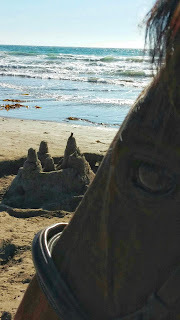 What more proof does a doubting mind need than 2 sand castles, brought to me, very specifically, through Horse!!! Well, I laughed out loud some more at my dear friend Seren, who knew exactly how to focus my attention on the hidden feelings. And then exactly how to affirm the message, that yes, it's time for us all to build the New Earth, the New Camelot- a version of Heaven on Earth that is fueled by Love. And for that we need to release all the old grief hidden within our cells. And then as if more proof was needed, I was reminded of more serendipity, more synchronicity. Back at the very beginning of this trip, Greg & I visited a gift shop and I was drawn to a card of a sparkling princess holding a hawk. 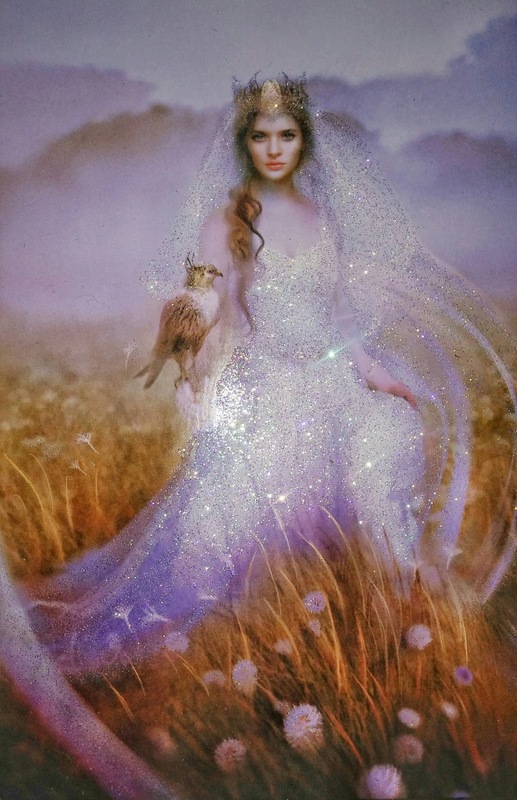 I bought it and put it on my altar in my little RV by the Sea before I turned it over and realized it was a depiction of, you guessed it: Guinevere. As in Arthur & Guinevere of Camelot. Of course, my given name Jennifer is a version of the name Guinevere! More proof for the doubting demon! Dare to Invite your Truth? Dare to Allow your Truth? Dare to Accept your Truth? And Dare to Speak your Truth? Your Truth Shall Set you Free. Share: What is one of your hidden Truths right now? Please speak it below in the comments. Although I had never consciously felt an affinity for the Legend of Camelot, the horses have been uncovering my awareness of Camelot for many years. You can read the story where I first became aware of the connection to Camelot through my horse Charm, who invited me to re-discover my Power in my chapter from our e-book: Spiritual Adventures with Horse.